This collection preserves the web sites of Virginia state agencies. The high school dropout rate not only indicates the success of our school system; it forecasts possible problems to come. 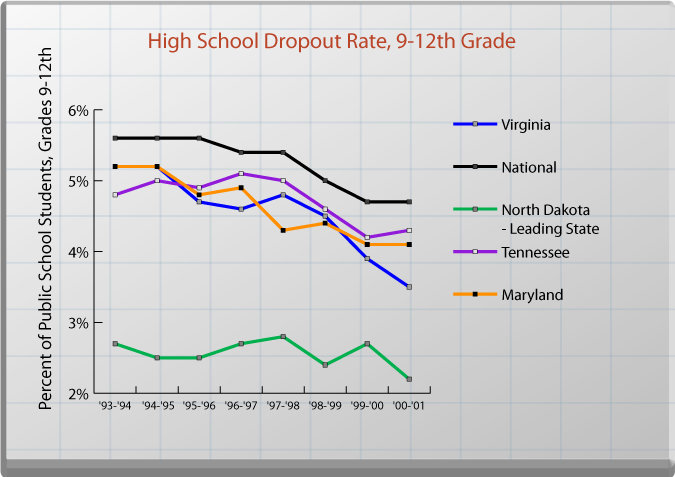 So it is with great satisfaction that Virginia can point to a dropout rate that has declined in recent years. Due to the efforts of schools and to outreach and GED attainment programs, the Commonwealth's rate is well below the national average. The high school dropout rate is one measure of the success of our elementary and secondary educational system. Moreover, because high school dropouts are at higher risk of unemployment and other social ills, dropout rates are a leading indicator of potential future problems. For example, according to the U.S. Bureau of Labor Statistics, in 2004 the national unemployment rate for those without a high school degree was 3.5 percentage points above that of those who had graduated from high school. Virginia's high school dropout rates, based on the National Center for Education Statistics data, have shown nearly uniform decline in recent years, falling from 4.8 percent in 1994-95 to 3.5 percent in 2000-01. During 2000-01 Virginia had the 10th lowest drop-out rate in the nation, after tying for 17th place out of 35 states reporting in 1994-95. The national average in 2000-01 was 4.7 percent. Virginia's rate is also lower than two peer states. Tennessee's rate in 2000-01 was 4.3 percent and Maryland's rate was 4.1 percent. (North Carolina data were not available). North Dakota had the lowest dropout rate at 2.2 percent. 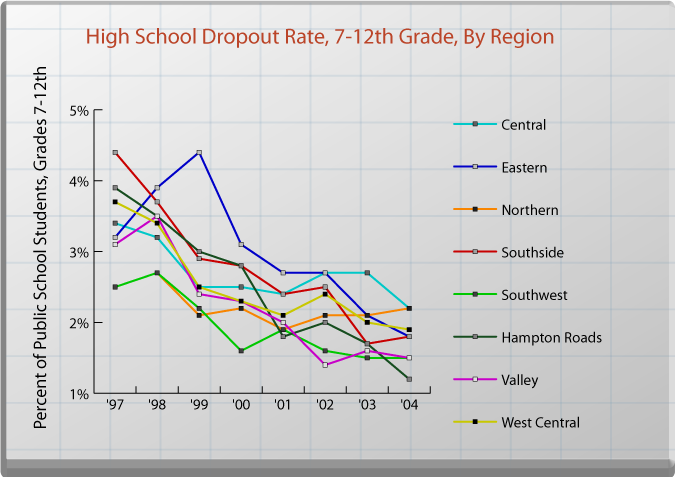 Based on Virginia Department of Education 2004-05 data, the regions exhibiting junior high school and high school dropout rates above the statewide average (1.9 percent) were Central (2.2 percent) and Northern (2.2 percent), while the regions with dropout rates below the statewide average were Eastern (1.8 percent), Southside (1.8 percent), Southwest (1.5 percent) and the Valley (1.5 percent). What Influences High School Dropout Rates? One of the most significant factors influencing high school dropout rates is family income. According to the U.S. Department of Education, students from low-income families are six times more likely to drop out of high school than students from high-income families. In addition, blacks and Hispanics tend to be at higher risk than whites, and recent immigrants tend to be at higher risk than those born in the U.S.
Programs like the Virginia Department of Education's Project Graduation, which is designed to keep young people in school by identifying and assisting students at risk of dropping out. Programs like Race to the GED and the Virginia Community College System's Middle College, which are designed to "recover" dropouts and assist them in obtaining a GED. Data is for Event Dropouts, which is the percentage of students 15 through 24 years old in a given age range who leave school each year without completing the high school program. State-level estimates are provided for public school students in grades 9-12. Board of Education Special Committee to Study Data and Policies on Dropouts and Graduation Rates: The Board of Education has formed a special committee to research and recommend policies to reduce the number of students who drop out of high school and to improve graduation rates, especially among minority students.